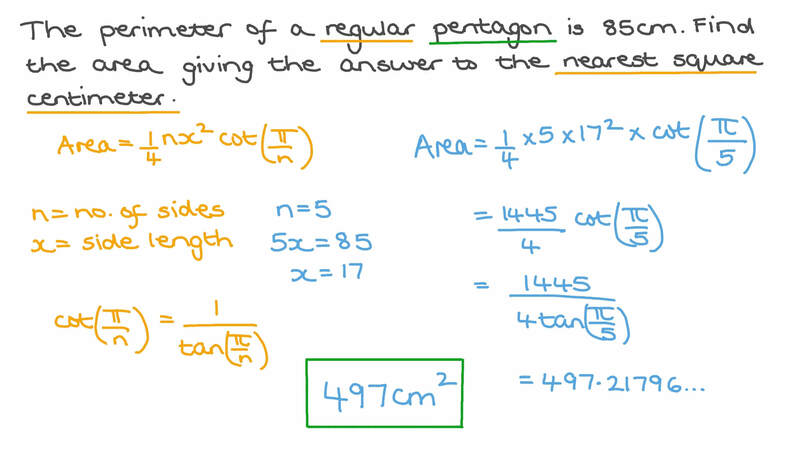 In this lesson, we will learn how to find areas of regular polygons given their side lengths. Find the area of a regular 14-sided polygon given the side length is 21 cm. Give the answer to two decimal places. The perimeter of a regular pentagon is 85 cm. Find the area giving the answer to the nearest square centimetre. Find the area of a regular hexagon with a side length of 35 cm giving the answer to two decimal places. The shown figure represents a circle inside a regular hexagon. Find the area of the shaded regions, giving your answer to the nearest tenth. The side of a regular octagon is 5 cm long. Find the area of the octagon giving the answer to two decimal places. The side length of a regular pentagon is 13 cm. Find the area of the pentagon giving the answer to three decimal places. A regular heptagon has a side length of 36 cm. Find the area giving the answer to two decimal places. Find the area of the shaded region rounded to the nearest tenth. Find the total area of the shaded regions in the regular polygons below, giving your answer to the nearest tenth. If four congruent triangles are cut off from the corners of the rectangle to make an octagon as shown, what is the area of the octagon? A regular octagon has a side length of 88 cm. Find the area giving the answer to two decimal places. The base of a fish tank is a regular pentagon with a side length of 189 cm. Find the area of the base to the nearest square centimetre. A flowerbed is designed as a regular hexagon with an area of 5 4 √ 3 m2 . Find the side length of the hexagon giving the answer to the nearest metre. The perimeter of a regular pentagon is 70 cm. Find the area giving the answer to the nearest square centimetre. Find the area of a regular hexagon with a side length of 38 cm giving the answer to two decimal places. A regular heptagon has a side length of 89 cm. Find the area giving the answer to two decimal places. The side length of a regular pentagon is 6 cm. Find the area of the pentagon giving the answer to three decimal places. The side of a regular octagon is 11 cm long. Find the area of the octagon giving the answer to two decimal places. Find the area of a regular 15-sided polygon given the side length is 66 cm. Give the answer to two decimal places.